Q & A’s problems have nothing to do with competency, credibility and quality. The problem that this film faces is the same one that many other decent films like The Spanish Prisoner, The Ghost Writer and Boiler Room; you can’t sell even top class drama to people without an A grade box office draw, regardless of how good it is. Without a Brad Pitt, Meryl Streep, Tom Cruise type, you might as well give up, that’s like making a soft drink more addictive than Coke and not bothering to market it. Kids won’t watch drama, and adults don’t watch enough films per year to get to good stuff like this which is a shame. 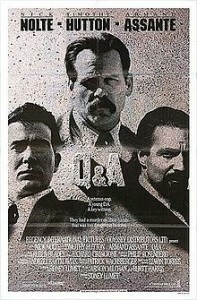 Lieutenant Mike Brennan (Nick Nolte) is a hard assed cop, weathered by decades of dealing with scumbags and kowtowing to prissy senior officers who have never worked the streets. Thanks to his flouting of the rules and short cutting of procedure, Brennan has a history of transgressions that is as long as his arrest record. And after a ‘routine confusing mix up’ ends with a dead suspect, he finds himself once more facing an investigation. This has happened to Brennan many times before, but this time is the first for Al Reilly (Timothy Hutton), who has been called in to ensure that the proper procedures are followed and the right boxes ticked off. Routine stuff. Routine indeed. Brennan wows the tribunal with a carefully concocted version of events (that directly contradict what the audience saw take place minutes earlier) and is out the door faster than you can say “police brutality” through chipped teeth. But Al is not willing to close the book on this case. He decides not to fluff over the inconsistencies in the story, to ask the obvious hard questions and not throw up softballs and chuckle knowingly at the winks. It is no surprise that the gruff and profane Brennan takes exception to such a position, and Al quickly learns that his adversary is far more than just a boorish thug. Despite being a vitriolic racist, bigot and unnecessarily violent man, Brennan knows every loophole in the book, and when none are available he gauges weaknesses in his opponent. If you’re 99.9% clean he’ll find the 0.01%… or make it up. Q & A starts as a fascinating character study, with Nolte chewing scenery as the intense and abrasive Brennan. No-one ever expected things to go smoothly, but unfortunately the film starts folding in oneself a little when the themes of corruption and racism are joined by depravity and old money, and the puppetmasters pulling the strings behind it all. Even after these unnecessary complications you remain transfixed on Brennan, a gnarly ball of coiled tension fueled by hatred. Assante too matches him with those steely eyes and a defiance earned by years of getting his way. Hutton is the weak link here, the strait laced decent guy trying to work the angles and overcome the powers of good-evil and evil-evil with a personality that lends only a sense of doubt to his efforts. As his Al becomes numb upon the realisation that even getting the bottom of things won’t necessarily mean he can win, we realise that regardless of the outcome this film is too complicated for its own good. If this film loses three sub-plots it becomes a solid 8, and saves 20 odd extraneous minutes in the process. Instead it remains as convoluted as LA Confidential, only without the well drawn characters and involving storyline. Q & A would be worth watching for Nolte and Assante going head to head alone. But the flaws and annoyances start mounting up. You are lead to wonder if 5 punches to the face and 5 ‘there-there’ kisses really cancel each other out. Final Rating – 7 / 10. Sometimes you have to take the good with the bad. Q & A could have been much more, but being merely ‘decent’ still isn’t that bad.